It’s often said that dishwashers save water over washing by hand. I’m not convinced, because it’s possible to hand wash dishes using very little water. And dishwashers use more electricity, and require costly supplies. My mother had one but found it too difficult to bend down to take dishes in and out. Still, they are convenient for most and I want to share tips for saving money and resources when you wash by machine. Always fill the dishwasher completely. Play around to fit in more utensils, but avoid stacking in layers.The water needs to reach the dishes from the top, center and bottom. Buy extra dishes, glasses or flatware if you often run the dishwasher for a specific item. If you use a solar water heater, connect your dishwasher intake pipe to the hot water instead of the cold. Then you won’t pay to heat up water the sun has already heated for free. If the water is cold no harm is done and unlike clothes, dishes aren’t harmed by very hot water. Check your manual to adjust the amount of rinse used in each wash. Stick with the lowest heat setting, even if it means washing a couple of extra dirty utensils by hand. 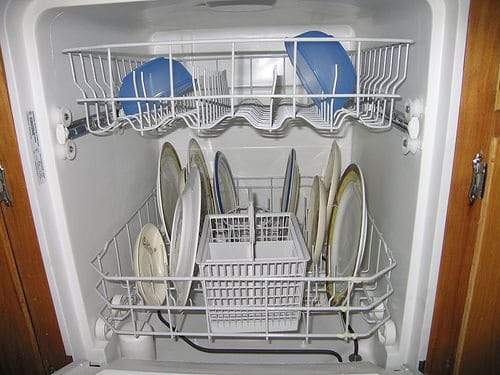 Clean the dishwasher every so often by cleaning a load at the highest setting. My technician recommends adding citric acid when the water is at its hottest. Wipe filters, walls, nozzles and seals regularly. Wash small parts in a pillowcase in the washing machine. Turn off the dishwasher before the final setting and let dishes air-dry. Scrape dishes carefully. Crumbs and bits of legumes, tomato peels, avocado, peanut butter and dough scraps often stick, while scraps floating around in your machine can leave scratches on glass and china. I use my dishwasher rarely. I mostly use it as a drying rack. I hate putting dirty dishes in the dishwasher and if I am rinsing them off I may as well just use soap and wash them. It’s an old dishwasher anyway and probably uses alot of energy and water. In our new place there is no room for a dishwasher so I will actually have to buy a drying rack. I didn’t realize you were moving so soon. I didn’t get a dishwasher myself till I had six kids! Now I’m totally dependent on it. This is some really helpful tips. I have always just stacked all the dishes in the dishwasher until it’s completely full (probably too full), and that’s it. I hardly ever scrape the dishes, although I know I should. I’ve never thought about cleaning the dishwasher.